Are you looking for wire rope Australia? All About Lifting supplies superior quality wire rope that businesses and industries can completely rely on. Whether you want to use wire ropes for lifting, or as cables for riser tension it is crucial to ensure you have the appropriate wire ropes. This ensures maximum performance and makes sure there are no lapses in safety. Wire ropes consist of several steel wires woven together to create individual strands set around a core in a helical pattern. This design makes wire ropes flexible, strong and gives them the ability to withstand bending stresses. 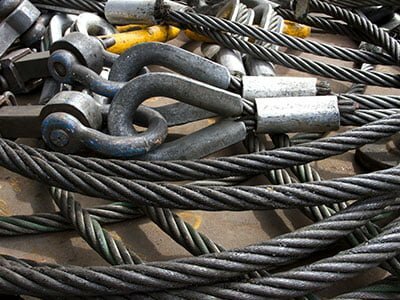 When it comes to selecting the correct wire rope you may want to consult an expert in wire rope Australia, such as All About Lifting & Safety. You will want to think about how you want to use the wire rope because differently configured wire ropes will serve different applications. One of the benefits of selecting the right wire rope with the right configuration for the job is that you will then see your wire rope perform optimally. Other benefits include the ability to withstand abrasion, fatigue resistance, crushing resistance, and rotation resistance. EIPS (Extra Improved Plow Steel). This is 15% stronger than IPS. EEIPS (Extra Extra Improved Plow Steel) that is the strongest, being 10% stronger than EIPS. Whether through damage or time, a wire rope will come to a point where it is no longer safe to use. The onset of corrosion brought about by lack of lubrication, as well as overexposure to heat and moisture. Overloading the limit for safe working. Improper installation of the rope which causes kinks. Using the wire rope when it is too stiff or even frozen. Mechanical abuse of the rope through crushing, cutting and dragging. It is important to carry out regular inspection of the wire rope so as to pick up any form of corrosion, surface wear or broken wires. These wires should be replaced immediately to avert potential hazards – especially to equipment operators and other people working nearby. Your safety is very important to us. That is why we only deal with wire rope manufacturers who adhere to high manufacturing standards and maintain high quality of production. Our combined eighty plus years of experience means we are industry leaders, with capacity and capability to advise you on the best wire ropes to suit your needs. Our team is friendly, professional and ready to assist you at any time. Call us today for all your lifting and safety equipment needs and wire rope Australia.